Hey its me K back like I promised. This is the last book that I had in my queue so if you are looking for someone to read and review your book just let me know. 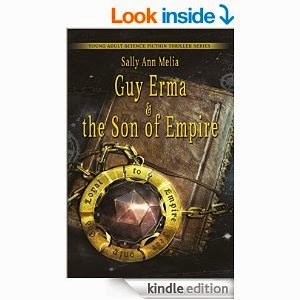 This one is called Guy Erma & the Son of Empire by Sally Ann Melia and you can get this book right now for $0.99 on Amazon here. I only had 2 dislikes with this book and both were that I had some unanswered questions. 1. I was wondering did the liquid fire destroy all cy-sect nests? 2. There were way too many plot lines to follow. One like I had is that the author explained how the prince was so easily captured. I liked it because it showed how a plan can be properly executed to set a story in motion. I am copying the description from Amazon because after reading theirs I decided that it is way better than the one I had written. Guy Erma and the Son of Empire is a new action adventure, set a long time ago on a planet far far away. Do I trust you? Dare I trust you? When you fight fearsome aliens who have advanced technology and are innately cruel to lessor species, how many men must die? What kind of warriors do you need? You need those who are not afraid to die. Those who have been tried in battle before. Those who are superhuman with cybernetic limbs and implanted weapons. You need dead heroes reincarnated as cyborgs. These are the Battle Borgs of Dome Elite.
" Someone somewhere had decided Sas Darona plague could be used as a weapon." Karl Valvanchi muses, "Yet practically unstoppable and growing exponentially these plague weapons went beyond deadly. They were planet-killers." The paths of Teodor Freyne and Guy Erma inevitably cross, their fate becomes that of the Empire they were born to when they discover a hidden terror. See this is why I wanted to read this book and why I hope that you check it out too.